UPDATE: This service is now available. Have a course this semester that requires Microsoft Excel or SAS? Students are eligible to download SAS, SAS JMP, and Mathematica free of charge under our campus agreement. Starting in Spring 2018, the IT Help Desk will provide a more convenient way for students to request help installing essential software on their personal computers. 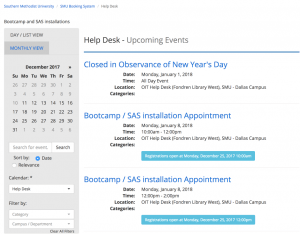 Beginning January 8, 2017, students will be able to schedule an appointment through our website for personalized assistance installing Boot Camp or SAS. For Mac users, there may be Excel plug-ins that are only supported on Windows, but there are still options! Boot Camp comes with your Mac allowing you to install Microsoft Windows on a separate drive partition, giving you the option of booting to Mac or Windows Operating Systems. While Boot Camp assistant is a handy option to guide you through the setup, you may run into questions and the IT Help Desk is prepared to help. If you have any questions, please contact the IT Help Desk at 214-768-HELP. Did you know that students can receive a discount on several software applications simply by using their SMU email address? Visit varsitybuys.com to download Windows 10 and more.